I grew up in a family without any strong ties to religion, which I now see as something of a privilege – although at the time I used to envy my friends their Sunday School adventures. Neither were my family overtly humanist agnostic or atheist. I just can’t remember any sort of conversations about faith or religion at all in our household. The only person I vaguely remember speaking about religion was my grandmother on my father’s side, who we affectionately knew as Nana Wiggy. 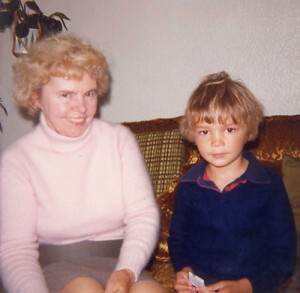 No one can remember why the family started to call her ‘Wiggy’, but she was a wonderfully kind, strong and opinionated lady who must take some credit for bringing me up in my early years during my mother’s battles with post-natal depression. As I’d never been Christened, Nana Wiggy always worried about my immortal soul, fearing I would remain in limbo forever more. I can’t remember Wiggy ever going to church herself, but for those like her that grew up in real poverty there was a sense that if you couldn’t be wealthy at least you could be respectable. Therefore, the ritual of Christening perhaps took on a vaguely superstitious quality for her and mattered, even though she wasn’t a practicing Christian herself as far as I’m aware. In my childhood, I myself did occasionally pray the selfish prayers of a child – for instance, that school be cancelled on the day of a test. However, beyond these failed attempts at divine intervention, I lived primarily without access to church, God, Allah, Buddha, and until my teens didn’t feel any the worse off for it. I’m not one who believes that moral values have to come from organised religion. I suppose that, growing up outside a religion, you’d have to believe that. It was when I was around 16 that I started to feel the need for some meaning behind what for me had been a happy and comfortable, although not an entirely untroubled childhood. My good friend Ian Hardcastle, who I was in a band with at that time, had been attending evangelical Christian festivals with his family since an early age and suggested I join him for Harry ’90 – a broad based annual Christian arts festival based, at that time, in my home town of Harrogate. This was a defining moment for me, and it was with a hunger that I consumed the both the artistic content of the festival (in the form of a multitude of gigs and exhibitions around the festival site) and the spiritual (in the form of seminars and discussion groups). 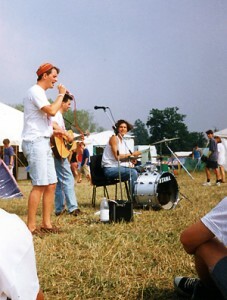 I would go on to attend the larger annual Greenbelt festival of arts, faith and justice for the rest of my teens. In particular, I would attend many seminars and ask awkward questions – for instance, I would ask why bad things seemed to happen to good people, and vice versa. My mother’s long term battle with severe clinical (chemical) depression troubled me. Wasn’t God supposed to be merciful and all powerful? Wasn’t that incompatible with my mother’s condition? And if God wasn’t all merciful, would I want to know Him? Despite people’s kindness and sincerity in trying to engage with me on these difficult topics, the conversation would usually boil down to me having to have faith, which didn’t sit well with a pragmatist like myself. Perhaps I wasn’t cut out for a personal relationship with a silent God – although the teachings of Jesus have always held an attraction and truth to me. Ironically, the most beautful souls that I had the fortune to encounter through these wonderful festivals of my adolescence were the ones that expressed the most doubt and showed the most humility in their faith. Here I must mention the brothers Martin and Anthony Wilson (no relation), who together made up the acoustic musical duo Sublime. Martin and Anthony made the most intimate, fragile and intense folk music, partly about the trials of a personal relationship with God… although, in many cases their songs could have been about any intense personal relationship. I would encounter the beauty of this art inspire by faith (or a loss of faith) again in the doubt expressed in the poetry of Welsh nationalist and clergyman, RS Thomas (read ‘Silence’), and the filmmaker Ingmar Bergman (see ‘Winter Light’). So for me, the spiritual life was, from the start, wrapped up with artistic expression and creativity. However, it was the silence of God that struck me more than anything during my early flirtations with Christianity. As for Sublime, although the Wilson brothers released only four humble self-produced cassettes between 1986 and 1991 (none available today), they are responsible for some of the most beautiful music and words I had ever heard at that stage of my life. I must thank Martin Wilson – a great guitarist and photographer (see Martin’s great photographic work) – and Anthony Wilson (now a fine published poet) – for being the inspiration behind much of my own guitar playing and songwriting over the years. Of course, none of this goes far enough to explain ‘Why Buddhism?’ which is, after all, the title of this post. But I think that is a good point to pause… for now.